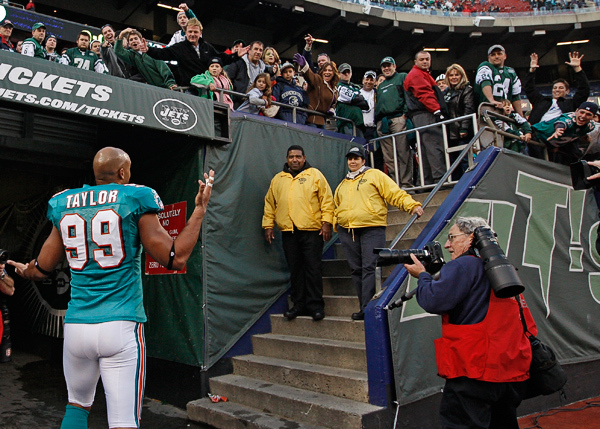 The Miami Dolphins will try to ruin the New York Jets‘ celebration on making the playoffs. New York Jets’ head coach Rex Ryan‘s comments last February might have been blown out of proportion about making the super bowl (might not even make the playoffs). There is a lot on the line for the New York Jets in making the playoffs, more than you would think. If the Jets win, quarterback Mark Sanchez will look like the “unsung hero” of New York. If they lose, the Jets could be looking elsewhere for a more sufficient quarterback. What about the coach? Ah Yes, Rex Ryan (the feet lover). It is funny how he can talk the talk but can’t walk the walk. He could possibly be on his way out since his words speak louder than his actions in every season. The Jets are on the verge of making or breaking. It seems to be that this victory is more important to keep their franchise alive. Miami has been in the rebuilding process this season with a possible new coach and new quarterback in the near future. This game has a presence for the team to finish strong after another tough year. If the Dolphins become successful out of this win, it will bring a little light on the dreadful 2011-12 season. 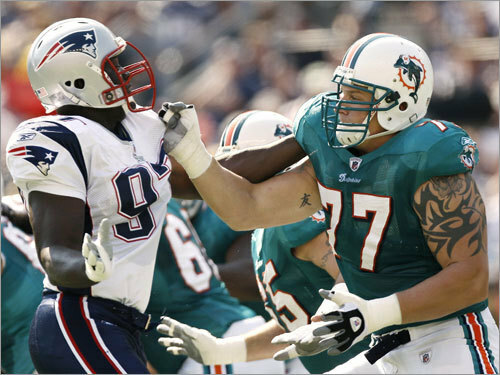 The AFC battle: New York Jets vs. Miami Dolphins- These two rivals have a record of 47-43-1 in advantage of the Jets. This game means much more than just a victory; it means bragging rights. The second team in line for the AFC East could be the Miami Dolphins or the New York Jets and this game could help this cause. Jets’ run offense vs. Dolphins run defense- LaDainian Tomlinson and Shonn Greene have a total 0f 1,223 rushing yards on the season, which is considered mediocre in the NFL. With an explosive back in Greene and a complementary back in L.T. these two can run through any force but can also be ran over at any time. The Miami Dolphins’ defense has been one of the rare strengths in their season. Defensive end Cameron Wake and outside linebacker Karlos Dansby have been the dominant pieces in their defense, which is ranked 14th in NFL defenses.This game will meet its expectations and be a battle for the new year. So who will win this game? Who has the edge? Prediction: MIA 34 N.Y.J. 20- The Miami Dolphins are going to send the Jets flying back to New York and put Rex Ryan in his place. And to top it off, the 15th year veteran linebacker Jason Taylor will leave the NFL with a happy and satisfied ending. Somebody tell Rex Ryan to stop talking and start living in reality. The New York Jets will never win a super bowl if quarterback Mark Sanchez is under center in my opinion. The past two games Sanchez has been terrible to say the least.In week 14 against the Philadelphia Eagles he had a total of 150 passing yards, two touchdowns, and two interceptions. In last week’s game versus the New York Giants, his performance became worse, he racked up 258 yards but threw for one touchdown and two interceptions. I don’t want to hear the bologna about the competitive and tough defenses he is facing, he has been in the league for three years now, there are no excuses. Want to be the best,you got to beat the best. If the Jets chose a different direction in going out and retrieving a better quarterback around all that talent, the Jets can potentially be a top team in the AFC but with Sanchez making the play calls, I don’t see it. Yes, he has tallied 3,267 passing yards, 24 touchdowns, and 15 interceptions but those interceptions might increase when they meet a tough Miami Dolphins’ defense. Matt Moore: Can not give this guy a break. He played like a stud in the first half of the week 15 loss against the New England Patriots but in the second it seemed like he vanished. You could blame the defense for Tom Brady‘s scoring but Moore gave away all the ball against a sluggish Patriots’ defense, who are last in the NFL for their pass defense. Week after week Matt Moore has been doing just enough to get a victory but this week I can see him having a big week. Last time these two teams met he did throw for 204 yards and two interceptions. Keep an eye out on the preview for Sunday’s game when the Jets fly into Miami to play the Dolphins on New Year’s Day. Miami Dolphins Preview: Dolphins fly North to play the AFC’s best Patriots on Christmas Eve. It’s about that time of year again. Every year around the holiday season, the New England Patriots and the Miami Dolphins have an AFC East divisional battle and expect the same tomorrow. Tom Brady and the New England Patriots are coming off a big win in “Tebowland.” Denver won six consecutive games before losing to the conference’s best. A big help in the victory came from tight-end Aaron Hernandez, who tallied for 129 yards and one touchdown. The Miami Dolphins have been playing pretty decent as of late including a huge win in cold Buffalo. In the victory, Dolphins’ running back Reggie Bush rushed for 203 yards (career-best) and is now 27 yards shy of a 1,000 yard season. The Miami Dolphins have nothing to lose as their playoff chances have quickly vanished. On the bright side, the Dolphins’ fan base saw some great preparation out of interim coach Todd Bowles in last week’s victory and look to keep the wins coming. The Patriots have been on fire as of late and could keep the fire going into the playoffs with 13 wins. With that, there are going to be key match-ups favoring both of the teams in the battle. Moore has been one of the most consistent quarterbacks in the AFC this season. The South Florida team has looked for a quarterback they can count on and Moore is making a case as I have said in my previous posts. Moore and Brandon Marshall’s connection is on-point as with Chad Henne, it is not as close. The long ball is working and very accurate to the Dolphins’ receivers Brandon Marshall, Charles Clay, Brian Hartline, and Davone Bess. Tom Brady has been one of the better quarterbacks in the NFL this season, if not the best. His two friendliest targets are tight-ends Aaron Hernandez and Rob Gronkowski. Both have a total of 21 touchdowns in the 2011-12 season. Brady has distributed 351 completions for 4,593 yards, 35 touchdowns, and 11 interceptions. The question is, who has the edge? I would say Brady, whenever you have number 12 on your side you can’t go wrong. Miami is ranked 7th in NFL rushing yards this season. Reggie Bush is 27 yards shy of the 1,000 yard count. This has been a definite breakout season for the sixth year veteran. In the past three games, he has tallied over 100 yards (vs. Raiders: 100, vs. Eagles: 103, and vs. Bills: 203). The Patriots running defense has been lacking this season and looks to get worse ranked 19th in the NFL. This season there has been an invisible force on the defensive line for the Pats, having trouble to get around the blocks. I would say Reggie Bush has the edge. He is reading all the blocks correctly and is moving north and south instead of east and west (applause). The Dolphins’ defense has quietly been one of the most dominant defenses in the NFL. They are ranked 3rd in opposition rushing yards and look to continue the dominance in stopping the run this week against Patriots’ running back Benjarvis Green-Ellis. However, the past defense has been awful, ranked 25th in the NFL. The Patriots haven’t been on the defense but there offense is the best offenses in the league. The defense will come to play but it will be tough to the pour the water on the hot Patriots. Could the Miami Dolphins win out? The Miami Dolphins lost seven straight games in the beginning of the 2011-12 season. Since then, they have won three straight games against Kansas City, Washington, and Buffalo. Dallas, Oakland, Philadelphia, Buffalo, New England, and New York are the teams left on the Miami Dolphins remaining schedule. It’s tough to win out but I believe the Dolphins can beat all of these teams left in the season. A battle of who can keep their streak alive sums up the game between the Cowboys and Dolphins. The Dallas Cowboys have three consecutives wins of their own going into week 12. So who gets their fourth? I have always said Tony Romo is one of the most inconsistent quarterbacks in the NFL and still believe it, despite where the Cowboys are. Romo has 2,000 passing yards with 19 touchdowns and two interceptions this season but the question that rises is which Tony Romo will show up week in and week out. With the Cowboys standing on top of the NFC East (6-4), there is some kind of urgency to stay on top of the one of the toughest divisions in the league especially with the Eagles struggling. The Oakland Raiders has been one of the biggest suprising teams this year leading the AFC West with six wins. The reason why they have been on a roll is their tenaisity in running the football.This year Oakland averages roughly 156 rushing yards per game. Plus with the acquistion of Carson Palmer sure gives them a more dynamic offense since the Rich Gannon days. Oakland could indefinitely lock up the AFC West with the San Diego Chargers struggling and the Denver Broncos hoping. Philadelphia has gone from the toughest team in the NFL in the beginning of the season to becoming one of the worst teams in the league. Is it because of injuries? I think even if Vick and Jeremy Maclin were healthy it wouldn’t matter, the team has not been in sync. Vince Young had one heck of a performance down the stretch on Monday Night but it’s tough to think that Vince Young could be their starting quarterback week in and week out. Seeing how the Dolphins dominated the Bills Sunday, there will be an essence of revenge in the air and a fight for who can keep up with the New England Patriots and N.Y. Jets in the AFC East standings. Buffalo’s woes are becoming even worse now that Fred Jackson is out for a good while with a calf injury. What is left in front are New England and New York. As of late New England has had troubles on the defensive side of the ball, especially with the pass rush. The Patriots are last in allowed passing yards with 300 yards. If Matt Moore can be secured he could go off and have a field day throwing to his destined targets. New York is having conflicts across the line especially at the quarterback position. Mark Sanchez could have to hand the reign to 41-year-old Marc Brunell. The Jets average 218 passing yards per game, which is 20th in the NFL and struggling to run the ball consistently has to be in the mindset of Rex Ryan. Does he bench Sanchez for the 41-year-old? All of these teams have some conflicts and woes in their organization thus far and could be troubling down the stretch. With the Miami Dolphins are on the rise. Change in the standings coming soon? What a crazy start to the 2011-12 season, teams like the Buffalo Bills and Detroit Lions are undefeated going into week 5. What is even more suprising are the Dolphins starting 0-3. You win some and you lose some, but all of them? This season has been extremely disappointing for the Miami Dolphins. Who to blame? Is it just simpily bad luck? Chad Henne has been consistent in a good way for once. He has showed off his mobility around the pocket. The only tough moment this year was last week against the Cleveland Browns, as a quarterback with little time in the game, your job is to get that first down. The pass to Brandon Marshall was not the best option from a viewer’s point of view. Is it win or go home for Tony Sparano? I believe so. If the Dolphins don’t win this week against the San Diego Charger I don’t know how you don’t fire him. If he doesn’t it will mean the Miami Dolphins’ organization is satisfied going into the bye week winless. 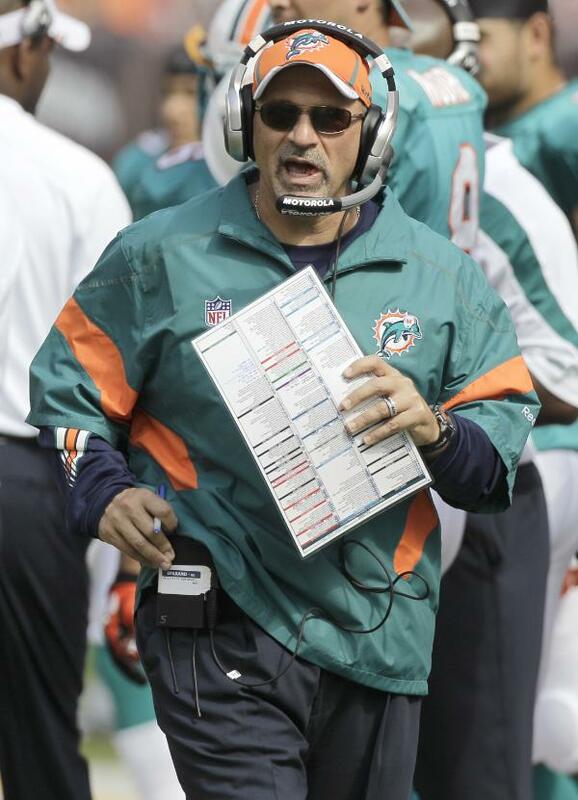 Evaluating Tony Sparano is tough because he is a players coach and everyone loves a players coach. This season he has one boneheaded calls down the stretch. In the first week against the Patriots, the Dolphins were down by 14 with a little under 8 minutes left in the game. Sparano calls a passing play with one yard to the endzone instead of a running play, which made a lot of fans raise an eyebrow. The week 3 loss was unlucky, we let that one slide. Defense where has it been? The Dolphin’s defense has been nowhere to be found. The only exception is there has been injuries but going from one of the best defenses to one of the worse just doesn’t sound good. 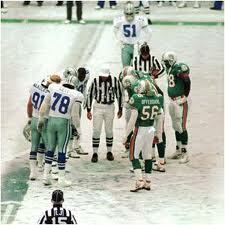 The Miami Dolphins have to be thinking win or else go get Luck. “Reggie! Reggie! Reggie!…” The South Beach fans have a new chant for the former USC Trojan. Reggie Bush was officially traded to the Miami Dolphins on July 29, 2011. The former Saint came to the Dolphins due to the draft pick of 2010 Heisman Trophy winner Mark Ingram. Bush did not have a great start to his career with the Saints. The Dolphins are hopeful they will get the Heisman Trophy winner in their backfield. Last season, Bush had down numbers, 36 carries for 150 rushing yards. In the 2010-11 season he was held back with a broken fibula in his right leg. With Miami Dolphins releasing both runningbacks Ronnie Brown and Ricky Williams means no more Wildcat right? Wrong, rookie runningback out of Kansas State Daniel Thomas has one hell of a talent and with the new acquisition of Bush the Wildcat offense will resume. On Monday night, Bush had an okay first appearance with 94 all purpose yards and a touchdown. Daniel Thomas was not present in the game against the New England Patriots due to a hamstring conflict, looks to be back with the team soon. Prediction for Reggie Bush: 208 carries for 965 yards, and 12 touchdowns. Which Chad Henne will we see this 2011-12 season? Beats me, you never know what he is going to do. I have contemplated if he is like those other inconsistent NFL quarterbacks out there like, Chicago Bears QB Jay Cutler, New York Giants QB Eli Manning, or Philadelphia Eagles QB Vince Young (the former Tennessee Titan). Henne is going into his 4th season with Miami Dolphins. This has to be the year right? In his career, the Miami Dolphins quarterback has a total of 27 touchdowns and 33 interceptions. The touchdowns is a decent amount but the interceptions need to decrease, especially at the end of the season. In the last six of last season he threw eight interceptions. The teams they played the last six games were the @ Oakland Radiers (W), vs. Cleveland Browns (L), @ N.Y. Jets (W), vs. Buffalo Bills (L), vs. Detroit Lions (L), and @ New England Patriots (L). More than half of these teams were under .500. The fact that the Dolphins lost to the teams included with deficit of 7 points or less is a little disturbing. Maybe if Chad Henne turned one of these interceptions into touchdown the team could have competed in the AFC East. So it’s time to move on, it’s a new year for Chad Henne. Besides the fact the Dolphins lost the Monday Night Football game, one thing to take out of the lost was the way Chad Henne played. The combined passing yards between Tom Brady (517) and Chad Henne (416) was 933. If Henne could play this good every game against easier defenses then the Miami Dolphins will have a promising season. Prediction for Chad Henne: 307-482 for 4,459 passing yards, and 18 touchdowns.